"My first tattoo was a real experience. Roger's professionalism and artistry made me feel very confortable. 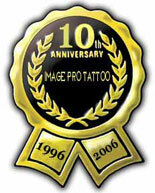 I love my new tattoo, and would recommend anyone to Image Pro Tattoo"
Image Pro Tattoo has been tattooing customers since the mid 90's. Newly relocated to the Acushnet area from Rhode Island, please stop by our shop and visit. It has always been Roger's passion to create works of art that allow people to get caught up in the routine of life and take in the beauty, that art, like a breath of fresh air can offer. Each person Roger tattoos can't wait to show their new art to the world, becoming an "award" presented to Roger in the highest form of flattery.